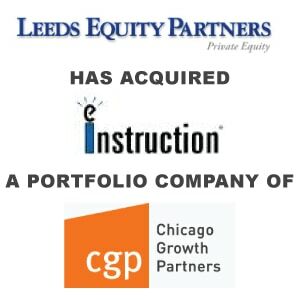 Berkery Noyes Represents Interwrite Learning In Its Sale To eInstruction - Berkery, Noyes & Co., LLC. NOVEMBER 29, 2007, NEW YORK, NY — Berkery Noyes, the leading independent investment bank serving the information and technology markets, announced Interwrite Learning (“Interwrite” or “the Company”), a leading developer of mobile teacher slates, interactive white boards and student response systems, has entered into a definitive agreement to sell the Company to eInstruction Corporation, a portfolio company of Leeds Equity Partners, LLC. The terms of the transaction were not disclosed. “The combined platform is a global technology, software, content and assessment powerhouse in the K-12 and post-secondary marketplace,” said Chris Curran, the Berkery Noyes Managing Director who advised Interwrite on the transaction. “The winning combination of Darrell Ward and Steve Kaye represents great leadership synergy for the merged companies,” Curran added. “Our solutions allow instructors and schools to maximize the educational value they can achieve from an interactive classroom,” said Steve Kaye, Interwrite’s Co-President and Chief Operating Officer. “Educators can utilize content, such as digital lesson plans and questions aligned to state standards, to provide formative instruction while being more efficient. Our customers can look forward to continuity on all our current products and the benefits that will soon deliver as we seamlessly integrate our best-of-breed portfolio,” added Kaye. Berkery Noyes initiated the transaction on behalf of Interwrite, acted as its exclusive financial advisor, and represented it in its negotiations with eInstruction. About Interwrite LearningTM – Interwrite traces its roots to the development of high performance digitizers for use in construction and estimating markets in the 1970’s. Interwrite later applied the basic principles of that technology to its first electromagnetic interactive whiteboard to provide interactive solutions to the education market. About Berkery Noyes – Berkery Noyes is one of the pre-eminent merger and acquisition firms serving the information industry, having completed more than 400 transactions since its inception. Among the most recent transactions completed by Berkery Noyes are the acquisition of eInstruction by Leeds Equity Partners, Monotype in its transaction with Calvert Street Capital Partners, Psychological Services, Inc. (PSI), in its transaction with ABRY Partners, The Teaching Company in its sale to Brentwood Associates, the sale of ELLIS to Pearson, Questar Educational Systems, Inc. by TASA, The Hampton Brown Company by National Geographic, Delta Education LLC by School Specialty, Inc, ProQuest Company’s acquisition of Voyager Expanded Learning, the sale of Facts on File to Veronis Suhler Stevenson, the sale of Kurzweil Educational Systems to Cambium Learning, and Dominie Press to Pearson Inc.
About eInstruction®– eInstruction pioneered the first student response system for the education market during the 1980’s. Its Classroom Performance System (CPS) provides instructors and students with real-time feedback on comprehension during instruction. Today CPS remains the leading student response system in education, being used with over 1.5 million students in more than 60,000 K-12 classrooms and over 400,000 students in more than 400 colleges and universities.